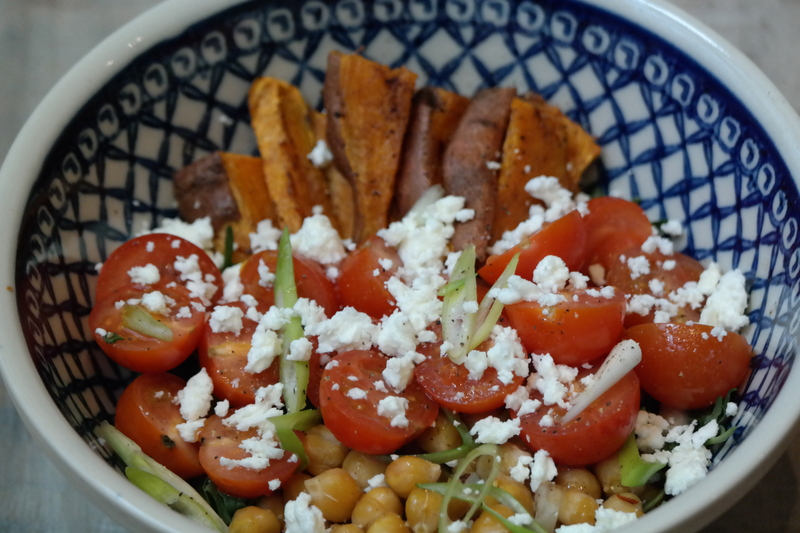 This salad is amazing as a lunch salad, but makes a great dinner as well. It should be enough for most girls, for the guys, you may want to add some proteine if you decide to have it for dinner. *When I first made this I also added chick peas. I have since left these out, but if you want a bit more body in your dish, it is a great addition. The pictures includes chick peas, as it’s an older pic. Preheat your oven to 220 degrees Celsius (hot air). Wash the sweet potatoes and cut them through the middle. Then cut into slices (the size of nice thick Belgian french fries). Use a roasting pan, baking dish, or lined oven tray and scatter the potatoes on there. Add a bit of olive oil, some salt, pepper and chili flakes. Put in the oven. After about 20-30 minutes check the potatoes, turn them and add some cinnamon. While your potatoes are in the oven, wash the arugola and cut your cherry tomatoes and spring onions. Add to a bowl, or a large platter. When the sweet potatoes are done (you can check, when nice and soft they are done. Should take around 30-45 minutes, depending on your oven. Some may take longer, but if you keep 45 minutes in mind you should be ok). Add sweet potatoes to the rest, crumble some feta over the dish, some more salt and pepper and the juice of ½ a lemon. Keep the other half to add more while you’re eating if desired. Mix well and then you’re ready to eat. Hope you guys like it as much as I do!